It is not every day that one of the world's largest technology companies announces a new CEO. So when Google announced that Sundar Pichai was taking the reins on Monday, his promotion gained thousands of column inches worldwide - not least of all in his native India. The Hindu newspaper called the news "a bonus for people of Indian-origin world over". The Times of India hailed the "quiet yet thoughtful" man from Chennai (Madras). But his ascent is far from unique. In fact, it is becoming ever more common for major international companies to have an Indian-born CEO. One study, by the University of Southern New Hampshire, says that Indian managers are more successful because of "a paradoxical blend of genuine personal humility and intense professional will". Whatever the model is, it seems to be working. 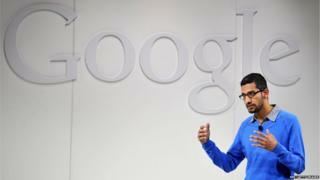 Mr Pichai is the latest, and the most high-profile, Indian-born CEO. You can read more about him here - but here are five more Indian-born CEOs who are making waves. Mr Nadella, 47, who was named the head of Microsoft in February last year, was one of the first to tweet his congratulations to Mr Pichai on Monday. On his first day in the job, the father-of-three sent an email to all staff, calling it "a very humbling day for me". "I am... defined by my curiosity and thirst for learning," he told staff. "I buy more books than I can finish. I sign up for more online courses than I can complete. "I fundamentally believe that if you are not learning new things, you stop doing great and useful things." Born in Hyderabad, he joined the company in 1992 and was previously in charge of Microsoft's Cloud OS service, which powers products such as Bing, Skype and Xbox Live. After working for Nestle, then PepsiCo, Mr Banga - who is from Pune - took over as CEO of the credit card company in July 2010. He began his career with Nestle in 1981. In a speech in April to his alma mater, the Indian Institute of Management (IIM), he outlined what he called the "grand plan" he had at the start of his career. "Get with somebody good. Get with somebody global. Do something that interested me. That's it. So, don't stress if you haven't got a detailed plan for your life. Anyone can have a good idea or plan; what makes it great is execution." Named the third most powerful woman in business by Fortune magazine last year, Ms Nooyi was, like Sundar Pichai, born in Chennai. She was named CEO of PepsiCo in 2006, having joined the company in 1994. The company she presides over is a food and drinks giant: some of the brands owned by PepsiCo include Starbucks, Muller, Frito-Lay and Tropicana. The company says 22 of its brands are each worth more than $1bn (£640m). "In my case, I benefited because I grew up outside of the United States," Ms Nooyi said in an interview in March. "I understand exactly how the world works, and I could see the world through the eyes of people from outside the United States." Mr Menezes, from Pune, is another IIM graduate. He took over as head of the British drinks giant Diageo in July 2013. Like Ajay Banga, he began his career with Nestle in 1981. Among the brands the company owns are Guinness, Johnnie Walker whisky, Smirnoff vodka and Captain Morgan rum. One of his biggest moves as CEO was to buy a majority stake in India's United Spirits company, though that deal has since provided Diageo with a number of headaches. Mr Narayen, from Hyderabad, has run the software firm since December 2007. He began his career with Apple. "There's an Indian community that's vibrant and thriving," he said of Silicon Valley in an interview in February. "We attribute a lot of that to the importance of education that we all grew up with." In the interview, he said Hyderabad's schools - modelled on the British public school system - helped his progression, as did having a foreigner's appreciation of the opportunity the US had given him.